Fridgies are small crocheted items that are intended to be refrigerator magnets. But these crochet patterns can be used for so much more. You can add this heart to any project you like, whether you use it as a pin or sew it onto a hat. The options are limitless. Glue heart fridgie onto magnet. This entry was posted on Saturday, March 7th, 2009 at 3:15 PM by Rachel Choi	and is filed under Free Crochet Patterns. You can follow any responses to this entry through the RSS 2.0 feed. You can leave a response, or trackback from your own site. This heart is so well-shaped. Kudos!! wonderful pattern! I used this to make an even smaller one on a G hook with WW yarn. Finishing: sc in end of each row and 2 in point at bottom, sc in each end of row until first lobe of heart. Im having a little problem with gaps in my heart. Especially where the.. “humps” are connected. Any advice on how to fix/avoid them? Hi Hezaaa, try to crochet slower when you make the humps, so that you don’t pull so much causing the gaps. This is so cute. Thanks so much for posting this up . Thanks for the inspiration. I´ve never crocheted anything but straight lines (like dishcloths). I tried the heart today and was skeptical that it would turn out or that I could follow a pattern like that. It was SO simple and SO cute. I´m inspired to go go go. Now I just have to figure out what to make! I think I´m addicted! love the finished result, but as a beginning crochet-person: can someone explain the turn? how does that work? I googled it, watched videos, but when I try it with this pattern it turns into a weird jumble. Hi Liz, when it says turn, you are at the end of the row, so take your work and turn it 180 degrees, so that you can make your next stitches on top of the row you just made. Hi Rachel! 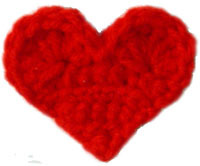 I adore your heart, I’m beggining to learn how to make crochet, I like to do this heart, but I don’t know what is means “sc” “tr” “dc”, i try super hard but itis diffucult to me, Can you please help me? Hi Yissel, check out the How to Read Crochet Patterns post. It will explain the abbreviations to you. Also if you need tutorials for each of the stitches, you can find links to them on the Crochet Abbreviations chart. I am a new crocheter but have tried several heart paaaaaatterns. I think I can do this. I woooooooooooooooooooould like it to be larger but not huge. Whaat size hook should I use? Hi Ruth, you can use any hook that gives your the size you desire. Just note that when using a larger hook, such as a J (6.00 mm), your stitches will be looser so you will have a more “holey” heart. You can also try using a thicker yarn for a larger heart. hey girls ~ does anyone know how to treble crochet? I honestly don’t know what they are talking about!! I’m going to make these for my students for Valentine’s day but have come across this term & do not understand it. Help please!!! im new to crocheting and i found your heart pattern. its awesome. love it. but i get holes sometimes. how do i fix that? Hi Justine, try to use a smaller hook and try not to pull so hard. It is suppose to have small holes though. You can also search on YouTube for tutorials on different stitches. I have learned many stitches on YouTube. Try it! Hi Rachel, Wonderful Pattern. I started making coasters (for cups) as gifts. I made wonderful Turkey’s for Thanksgiving and Santa for Xmas. How would I enlarge your pattern for a coaster where the largest part of the heart is 4 inches in diameter? How would you make this heart pattern larger. I’d like it the size to be used a coffee cup coaster. Maybe 4 inches in diameter. Thanks. (I forgot to check the notify me of follow up comments by email on my first submission. Perfect exactly what I was looking for thanks again for pointing out the Cool Coasters #4 was looking for a coaster for my sister to put her candle on thank you so much.